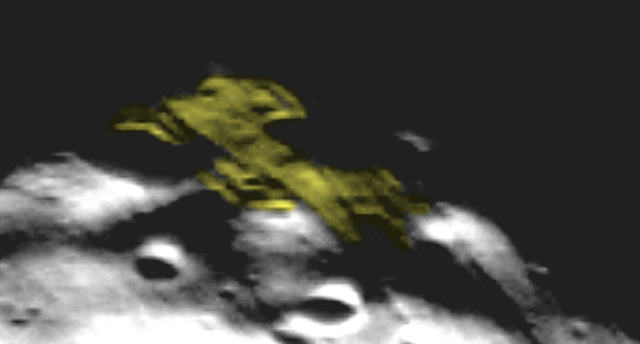 UFO SIGHTINGS DAILY: Buzz Aldrin Monolith Finally Discovered On Mars Moon Phobos After 7 Years Of Searching, Dec 2016, UFO Sighting News. Buzz Aldrin Monolith Finally Discovered On Mars Moon Phobos After 7 Years Of Searching, Dec 2016, UFO Sighting News. Below, you see the simple process of just adding light to make the Phobos Monolith visible. Buzz Aldrin gave a interview on C-Span about 7 years ago where he stated, "visit the moon on Mars. Theres a monolith there. A very unusual structure on this little potato shaped object that goes around Mars once every 7 hours. When people find out about that, they are going to say, who put that there? Who put that there? Well, if you choose, the universe put it there." Needless to say, this got me and other UFO researchers excited years ago, so we have all been looking, searching for this Buzz Aldrin Monolith he speaks of. 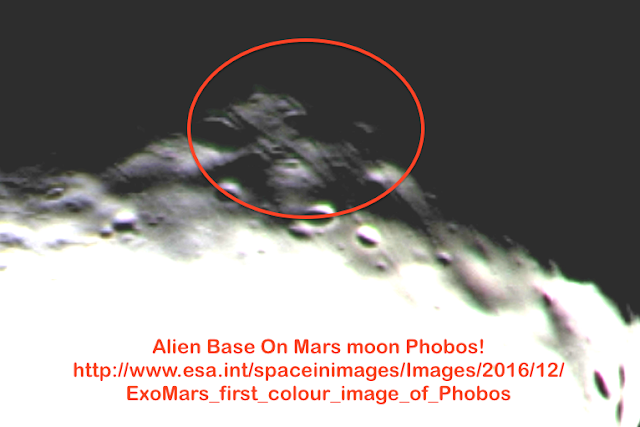 Last night, I decided to take a look at the ESA site and the first photo I came across was in HD...and was of the Mars moon Phobos. This ESA image was just put up for the public to see on Dec 6, 2016, so its the newest out. There was only 25% of the moon visible because there was a shadow over its other 25%. I thought I could add light to the HD photo in order to explore the other 25% and low and behold, I made a huge discovery...the Buzz Aldrin monolith. Its much bigger than any of us thought. We all assumed that the monolith was this tall rectangular structure that was found about 5 years ago, but it wasn't. That was nothing. 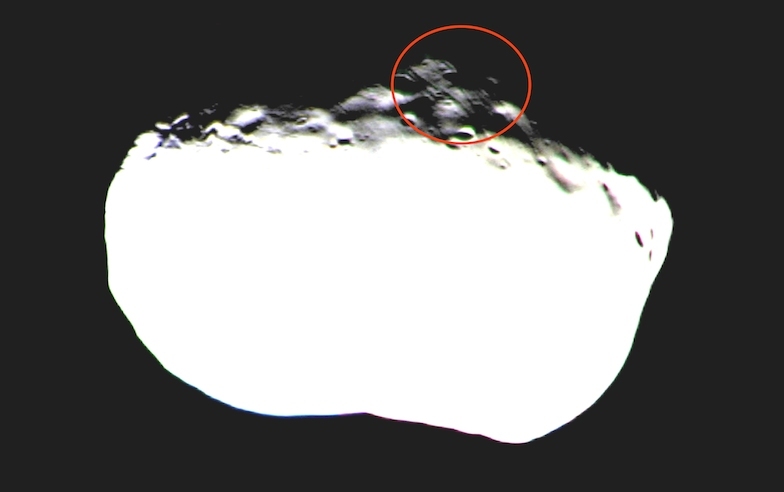 This new structure is very big, and must have been smudged out using photoshop on most other Phobos photos in existence. The ESA editors must have missed this one, because its 100% evidence that aliens have constructed it and used the Mars moon as a space station...and may be controlling the moon, its orbit, speed even today. Phobos is 7 miles in radius, thats 11km. 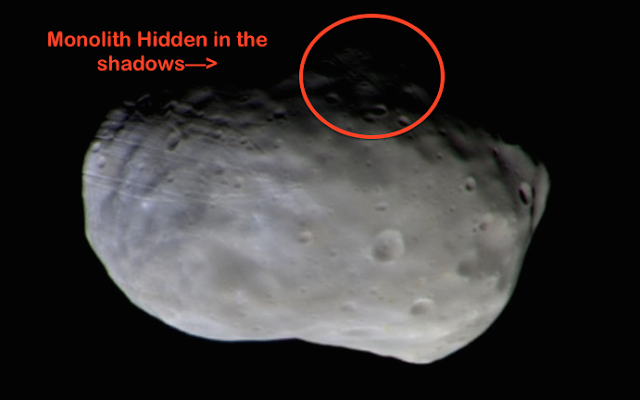 So if we use this full photo of Phobos and compare it to the structure, we find that the structures length is 1/5 that of Phobos, meaning the structure or ship is approximately 1.4 miles long or 2.2km. Thats huge! Buzz was right! Above photo from ESA has only added light. Below is original with shadow. July 2009 Video Interview With Buzz Aldrin About Phobos.